29 How Right You Are: a card is selected from a pack and returned. The pack is shuffled, and the cards dealt slowly onto the table. At any time, the spectator says "stop". The card stopped at proves to be the spectator's card. An original Svengali deck routined updated for rough & smooth. 36 Koran Torn and Restored Newspaper: a newspaper is clearly ripped into small pieces, given a shake, and found to be whole again. Uses a tabloid size paper and needs a metal strip. 50 Crazy Fans: a close up fan routine. 61 Fred Robinson explains the Invisible Riffle Pass and the Bottom Deal. 61 The Invisible Riffle Pass: top and bottom of deck is transposed during what appears to be a riffle. Also found in Elliott's Last Legacy, Hugard's More Card Manipulations Part I, and Norman's Basic Card Technique. 65 The Walnut Shells and Pea: Ganson's Three Shell Game routine. Making the shells and the peas; The basic move and steals; a 4 phase routine; and a few additional moves with the shells and pea described. 71 Gambler's Luck: Cards are cut into piles, the four kings appear on top. A rabbits foot is placed on the table for luck, the kings are moved to the bottom of the deck. A poker hand is dealt, with the Performer's hand being dealt from the bottom, of course with good results. This is repeated with "no cheating", but this time the performer gets four aces. 74 Ken Brooke's Cups and Balls: As described by Ken Brooke. A routine using 3 "standard" cups, cork balls, and a vegetable (such as an onion) climax. Recommends the Vernon coin vanish found on page 666 of Greater Magic. 80 The Egg on Fan: paper visibly changes to an egg when bounced on a fan. The egg is broken into a bowl to prove it is real. Shows how to prepare the egg and provides the routine. 83 Card Production Supreme: to be used as part of a larger routine. Cards are produced from the hand, even with the fingers spread. 87 Matchic: Adapted from Hans Kaiser routine. A paddle routine using wooden matches.The heads disappear, change places, and change colors! 89 Readapack: A shuffled pack is placed on the performer's palm. The deck is cut and by looking at the cut, the performer can reveal the next card. This can be repeated and uses a non-gaffed deck. 91 My Name - Your Name. Adaptation of Dr. Daley's "Ad Lib Spelling". A card is selected and returned to the deck. 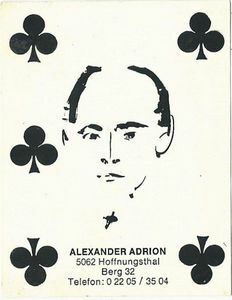 The performer demonstrates how the card will be discovered by spelling his own name. The spectator now spells his name, and finds the selected card. 93 Magic With Coins: from the weekly "Abracadabra", first two sleights based on work by T. Nelson Downs. 100 Koran's Solo Aces: Four aces form a diamond. Three cards are placed on top of each. The aces leave the piles and join a chosen ace one at a time. 107 Harold Beaumont's Dice Routine: A clever four effect dice routine demonstrates magician's control of the dots. Uses two die and the familiar paddle move. 108 Thought Prescient (Harold G. Beaumont - a different Harold than above! ): A card is shouted out. The Performer tosses a deck of cards in the case and puts it on the table. One card is missing: the named card!